Recreation in Southwest Colorado in the mid-1930s. 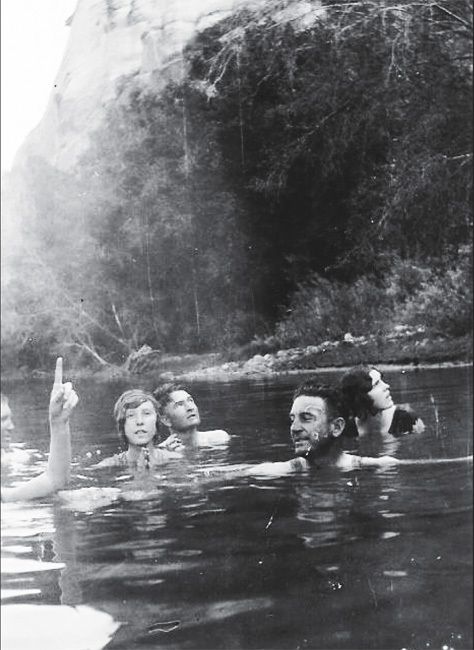 This farm family hiked down to Dolores River below Lone Dome for a swim after a week of work. Hey, let’s hit the slopes this weekend, there’s a good storm blowing in some fresh powder, it will be great! Here we are in the recreation capital of Southwest Colorado, and it is free. Well, maybe not so much. We hear a lot about “recreation” or “recreation Industry,” but just what is recreation? Is it going bowling, dancing, hiking, biking, skiing, horseback riding, four-wheeling, fishing, hunting, motor-biking, riding ATVs, swimming, picnicking, camping, bird-watching and photographing? It may be all of those, or some, or none, depending upon who is involved and why. According to Webster, recreation is “restoration to health; to create anew; restore, refresh; refreshment of strength and spirits after work; a means of refreshment or diversion.” Now I begin to wonder how skiing into a tree and crashing a bike, sending the “recreationist” to the hospital, is “restoring to health.” So what is my point? Recreation used to be to relax and enjoy something different after working hard all week in some industry of manufacturing, building, agriculture, etc. It cost very little if anything. Today, “recreation” has become a large consumptive business and is not by definition an industry. Industry produces a tangible product to be sold or exchanged, thus creating new wealth and economy. Recreation and tourism sells or exchanges a product manufactured by industry and/or a service to a public, thus simply redistributing wealth that was earned or produced elsewhere, it does not create new wealth. Many of the products for recreation are actually produced overseas in places such as Vietnam, China, and Indonesia. Today’s work environment provides personal income that may be used for recreation “activity” such as completing a bucket list for having climbed all fourteeners or hunting a record 6×6 bull elk, or the challenge of a new mountain-bike trail. That is all great, but everyone has their own different and varied interests and wants. Recreation and tourism has morphed into largely a luxury expenditure that many go into debt to participate in. Is that bad? Not if you can afford it and we are happy for businesses to help you to redistribute your wealth/debt. We all have the liberty to make our own choices — just don’t let your choices nullify my choices. By necessity, my choice is for low or no-cost recreation. Here in Southwest Colorado about 73 percent of the public lands of the state are controlled by the federal government, which seem to be controlled by tax-exempt special-interest corporations by threat of litigation. These lands hold the greatest opportunity for recreational activity by our local people as well as tourists. That brings up the next question: What recreational interests should have preference over the others for use of the public lands? That is the basis of the current litigation over the Rico-West Dolores travel management plan. An environmental group doesn’t want motor bikes on an historic trail that they want. What “right” does any user group or person have to the land, resources or trails? ZERO, nothing under the Supreme Law! Recreation and tourism revenues are nebulous and fickle at best. What happens to recreation businesses when there are wildfires, low water levels, high gas prices, road closures, recreationuse regulations, oh and government shutdowns? Recreation and tourism are fair-weather, “soft” economies. We certainly should promote and make the best of them, but concentrate on rebuilding our economy through energy, manufacturing and agriculture. Recreation can and will result when those basic economic drivers are healthy and growing.